A Waterfront Key West Style Home. Home is immaculate and furnished fully. House, 2 BR's + sleeper, 2 Baths, (Sleeps 6), 1 screen porch & MBR-w/porch. Beautiful Key West Style Cottage on Quiet Canal in Steinhatchee, Fl. Cottage is on a Deep Water Tidal Canal(Suitable for Approx. 20 ft Flats Boat W/No Top), Floating Dock with Access to Gulf and Public Boat Ramp. Or for a small fee, DEEP WATER DOCKAGE FOR ANY SIZE OR TYPE OF BOAT ON RIVER LOCATED SEVERAL HUNDRED YARDS ACROSS FROM MY HOUSE. Located directly behind house is a Fish cleaning station. There is room to park your boat trailer and a couple of vehicles on property. Natural Paradise for Some of the Best Salt and Freshwater Fishing, Canoeing and Scalloping in Florida. Beautifully Decorated with a Screened Porch, Balcony, TV'S in All Rooms, Fully Equipped Kitchen. Sleeps 6 in Beds. Only a 10 minute Boat ride (no wake) to the Gulf. .5 mile from restaurants, grocery store, Dollar General and boat ramp. approximately 1 mile to everything Steinhatchee has to offer. Located in a very private area of Steinhatchee. From Valdosta Ga. and purchased as a second home to go offshore fishing. Also enjoy fishing the river and inshore fishing along with scalloping. The home makes a great get away to relax and enjoy the many water and non water activities or simply spend time relaxing. Community does not have one stop light. I find many of the same renters coming back each year along with new ones as well, including a couple of monthly renters from the Northern area. They tell me the house is always immaculate and kept freshly decorated and the location is the best. Give us a try and see how you like it. One of the best areas in Steinhatchee and property is located only 10 minutes via boat to the Gulf (no wake ride). 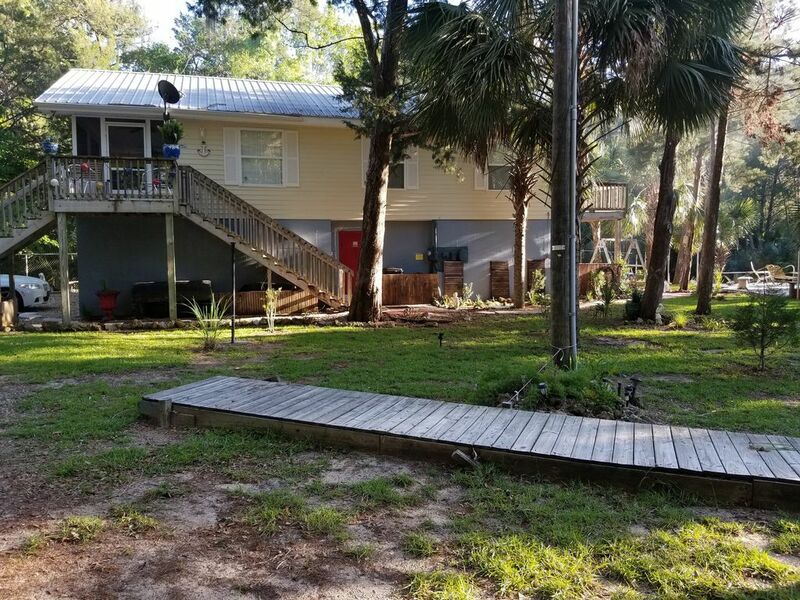 Yard is fenced in offering landscaping, private dock and floating dock to park your boat (boats up to 22 ft with no hard top). Dock is excellent area to relax and cook out. There is a fish cleaning station on the dock. Also have dockage available directly on river for any size boat. Home offers a large screened in porch and the master bedroom has a King size bed and a comfortable loveseat to relax while watching TV and has a private porch overlooking the canal with a bistro set to enjoy a cup of coffee or your favorite beverage.. House is fully equipped with all amenities. Very clean, immaculate and furnished/decorated nicely. Nature fully exposed with river, wildlife, Gulf and beautiful sunsets! Several state parks are only a few miles drive to spend the day. The small community is blessed to have a Grocery store, several convenience stores and a Dollar General. If you need a charter for any water activity, they are always available and at great rates. Also you will find many locals who are ready to clean your catch of the day, from inshore, offshore fish and scallops. There are several great landmark restaurants located within a mile of our house. Several full service marinas to launch your boat or get fuel and bait/ice. Also available are rentals for boats, Kayaks and Golf carts so you can fully enjoy your vacation. Night time is always an adventure with a couple of local hot spots usually offering live bands and/or karaoke and the location is close or on the water with outside Tiki style bars. My property is surrounded by nature that encompasses large Oak trees, Cypress trees and many other natural elements great for exploring or photography. toilet, shower, Features Soap, Shampoo & Conditioner Dispenser. toilet, combination tub/shower, shower, Features Soap, Shampoo & Conditioner Dispenser. The mouth of the beautiful Steinhatchee River is about a quick 10 minute ride (via boat-NO WAKE). The Public boat ramp is less than a 5 minute drive located across Ideal Marine Supply Store. Directly behind house a canal to accommodate boats up to 21ft with no hardtop. River dockage available. All linens provided. Extra blankets and pillows provided. Laundry Detergent, Fabric Softener provided. Plenty of parking and room for boat trailer. Our Living Room is very cozy and the couch is also a pull out bed. The Kitchen is adjacent for family entertainment. Enjoy the outside fire pit and the hammocks and hammock chair. General Spices included. Salt, Pepper, Sugar,etc. Equipped fully with all dishes and utensils. Many other items are included. Multiple places to enjoy dining...inside or outside. Outside includes the screened in porch, Master Bedroom porch, on the dock or outside dining table located by dock and grill. LCD TVS in each bedroom and living room. Every room has a DVD player so guests can enjoy their favorite movie from a large library of DVDS. We offer a DVD/Blu Ray/Entertainment player connected to all TV's.. There are usually a few books and magazines. Adult and Children Board Games. Playng Cards. Full array of adult and children DVD's. Large private yard, partially fenced, with private dock on canal. Relax in the full hammock or hammock chair. Fire-pit for chilly nights. Located off the Master BR over looking canal and dock. Private screened in Front Porch with a swing, Rocker and 2 chair BISTRO table. Two hammocks, a hammock swing along with a swing and plenty of seating. Fish off the dock with full cleaning station. Or just relax in the sun. Very pleasant stay in a secluded hideaway on a canal just around the corner from the Marinas and restaurants. Nice comfy place! Enjoyed our stay and would go back again. Would recommend this place to others. Close to everything. Thank you for the nice comments. I welcome you back any time and thanks for being great guests! Nice quiet relaxing accommodations. Very well kept and stocked. Owner is great. Thanks for choosing my property for a quick get away. It was a pleasure having you as my guests and furthermore are very good stewards of the property. I look forward to having you back! Awesome house in a private area of town. Would recommend to anyone. Michael was a great host. This was our second year staying at this house. The house is an amazing place to come home to after a long day of scalloping! Loved the outdoor grill and relaxing on the back deck! Bugs were put in the evening, but there were three citronella candles that helped out. The front, screened in porch was also a nice spot to relax, and it kept the bugs out! The house was nice and spacious. There were theee couches in the living room. Plenty of room to lounge and relax! Nice kitchen to cook dinner in. Clean linens and towels provided. Overall, very happy once again! Thank you for staying at my property again and great renters. I look forward to having you guys again. Thank you for the kind words and look forward to your next visit. You were great guests! Steinhatchee Florida attracts thousands of visitors throughout the year. Most are returning visitors who actually live on the Atlantic side. Depending the time of year determines fishing laws that can be found on the Florida Wildlife website. Many visitors come to stay either all summer or winter or for an extended period of time to enjoy this quaint and pristine town with no red lights. The community is golf cart friendly but laws do apply. The town is best known for its fishing both fresh and salt water (inshore and offshore). Of course SCALLOP SEASON is considered the PEAK SEASON. Steinhatchee River offers great Kayaking, fishing, bird watching, or simply enjoying Florida's Forgotten Coast. Photography is popular due to the overall ambiance of the area. There is a Dollar General and small Grocery store (for larger shopping, Walmart is in Perry FL, about 40 miles away) . Several nice sit down restaurants, fast food like Hungry Howies with riverside dining, Subway, a homemade ice cream parlor and a delicious BBQ stand, Skullyz. .For later nights there are a few night clubs and bars. In addition, Steinhatchee had several Marinas and boat ramps for public use. We are located less than a mile to a boat ramp. If your boat is 20-21 ft long and does not have a hard top or a very high windshield, you can hop on your boat from our dock that is on a deep water tidal canal. Several hundred yards away you will be on the Steinhatcee River and a very short boat ride to the Gulf. Along the way are several Marina's for bait, ice, supplies, purchase fishing license and of course gas. There is also a full service marina that offers boat repair. Perry Florida is only 40 miles away offering many of your big box stores and chained restaurants. Renters are responsible for any damages to property. If possible, please take garbage to the near by dump site. A map is provided on the refrigerator. Please be sure to keep lids on garbage cans due to Raccoons scattering garbage. Please turn off all lights and fans, TVs and the air conditioner or heat. Most of all have a fun and safe trip!